Precious metals, particularly gold, are a very common investment opportunity in our modern world. Gold has become extremely popular both as a hedge against inflation and currency devaluation and as a primary investment with historically solid returns over time. Many small-time or new investors are eager to invest in gold; however, the high prices and multitude of investment options can be overwhelming. Buying gold physically in the form of bullion or coins, trading for gold in the foreign exchange markets, or trading a variety of gold related stocks or mutual funds are all viable methods to invest in gold. Some of these methods can seem downright frightening for the new investor, but don’t fret! This wide variety of options ensures that investors have a good deal of control over their investments. When most people think of gold as an investment, they often think of physically owning gold, and this is still a common way to invest in gold. Perhaps the most iconic image of gold investing would be the gold bar. 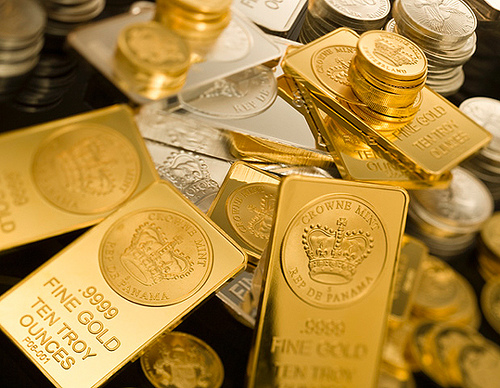 In some countries, gold bars are regularly sold by major banks in standardized quantities. In the United States they can be slightly harder to come by. Gold is also regularly traded in the form of gold coins, with by far the most popular example being the Krugerrand. The Krugerrand, a gold coin from South Africa currently makes up approximately 90% of the gold coin market globally. Other countries offer similar gold coin options, such as the Chinese Gold Panda and the American Gold Eagle coins. These coins typically contain exactly an ounce, or fraction of an ounce of pure gold but may be alloyed with other metals so the gross weight of the coin will be slightly more than an ounce. There are also Numismatic gold coins such as the $20 “Double Eagle” which contains approximately (but not exactly) 1 oz of gold, the $10 “Eagle”, $5 “half eagle” etc. These coins were once used in circulation as money with the “Liberty Head” $20 coin being minted from 1849-1907 and the St. Gaudens $20 gold coin minted from 1907 through 1933 when Roosevelt took the U.S. off the gold standard. Numismatic coins may carry additional collectors value based on condition and rarity in addition to the value of the gold they contain. Physical gold has one major, obvious advantage: it is tangible. If you decide to purchase gold bars, you can actually hold them in your hands and thus they are a “pure asset” in contrast to a “paper asset.” Every paper “asset” is also simultaneously someone elses liability. Physical gold is simply an asset… you do not have the risk of default. However, the problem that counterbalances this advantage is the risk of theft and counterfeiting. Finding a reputable dealer is imperative if you are considering physical gold as an investment to avoid the possibility of counterfeit gold, and you as the investor are entirely responsible for the storage and security of the gold. In addition to reputable dealers, there are three major coin certification agencies that guarantee the authenticity and grade of gold coins. They are NGC, ANACS, and PCGS. These three are the only reputable consistent grading organizations. All others tend to “overgrade” so an average or low grade coin can be sold to an unsuspecting public as a high grade coin. There are organizations like BullionVault that offer sales and storage of gold bars. You can buy as much or as little gold as you want as long as it is done in 1 gram increments. Storage fees (including Insurance) are 1/10% per month and you can choose the vault location (including Switzerland) and buy and sell your gold online. You can even buy from or trade with other BullionVault members. Another common method investors have used to increase their exposure to gold is to invest in gold mining stocks. This idea sounds fantastic in theory; however, there are significant problems. Mining companies are rarely devoted 100% to gold. More importantly, it’s important to remember that a mining company’s performance does not always stay directly tied to the price of gold as a commodity. Factors relating to running the business itself often have a very significant impact on the price of mining stocks regardless of where the spot price of gold is moving. Many mutual funds and exchange traded funds (ETFs) have sprung up recently offering exposure to gold to everybody from the small retail trader to the large institutional investor. Gold mutual funds are the easiest way for new traders to invest in gold. These funds offer convenience, electronic transfer, no storage issues or costs, while showing returns closely tied to the overall price of gold although recently there has been some concern that the gold backing some of these funds may not actually be there and so they are once again just a “promise” for gold and not a physical asset. Christopher Durich is a financial planner who focuses on tackling investing early on. good post.thank you for your post.